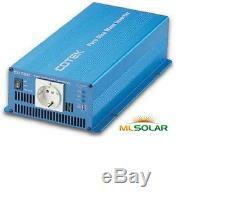 COTEK SP3000-124 3000 WATT 24 VOLT HEAVY DUTY PURE SINE POWER INVERTER (SOLAR). This high efficiency microprocessor controlled DC-AC inverter converts 24 Volts DC (Nominal) to 3000 watts of pure sine-wave AC power at 100/110/120 Volts, 50/60 Hz. The unit comes with input battery cable lugs and dual NEMA 5-20R GFCI receptacles. Features include overload, short circuit, over-temperature, under & over voltage protections, low power saving mode to conserve energy. The unit is e-13/ CE / FCC approved and the safety standards of the unit conform to UL-458 specifications. Pure sine wave output(THD <3%). 50/60Hz switch selectable output frequency. Input and Output fully isolation design. Low power saving mode to conserve energy. 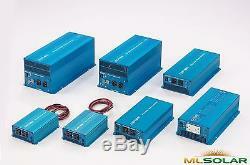 Short-circuit, over-voltage, under-voltage protection, over-temperature, over-load protection. Meets UL458 (but is not UL listed). 17.8" x 8.2" x 6.5. Field work / Construction sites. Home electronics: TV, VCR, video games. What is a Pure Sine-wave Inverter? The output voltage of a sine-wave inverter has a sine wave-form like the sine wave-form of the mains / utility voltage. In a sine wave, the voltage rises and falls smoothly with a smoothly changing phase angle and also changes its polarity instantly when it crosses 0 Volts. What is a Modified Sine-wave Inverter? In a modified sine wave, the voltage rises and falls abruptly, the phase angle also changes abruptly and it sits at 0 Volts for some time before changing its polarity. What are the advantages of Pure Sine-wave inverters? The output wave-form is a sine-wave with very low harmonic distortion and clean power like utility supplied electricity. Inductive loads like microwaves and motors run faster, quieter and cooler. Reduces audible and electrical noise in fans, fluorescent lights, audio amplifiers, TV, fax and answering machines. Prevents crashes in computers, weird print outs and glitches in monitors. Which devices will not function properly from a Modified Sine-wave Inverter? Any device that uses a control circuitry that senses the phase (for voltage / speed control) or instantaneous zero voltage crossing (for timing control) will not work properly from a voltage that has a modified sine wave-form. Also, as the modified sine wave is a form of square wave, it is comprised of multiple sine waves of odd harmonics (multiples) of the fundamental frequency of the modified sine wave. For example, a 60 Hz. Modified sine wave will consist of sine waves with odd harmonic frequencies of 3rd (180 Hz), 5th 300 Hz. The high frequency harmonic content in a modified sine wave produces enhanced radio interference, higher heating effect in motors / microwaves and produces overloading due to lowering of the impedance of low frequency filter capacitors / power factor improvement capacitors. Some examples of devices that may not work properly with modified sine wave and may also get damaged are given below. Laser printers, photocopiers, magneto-optical hard drives. The built-in clocks in devices such as clock radios, alarm clocks, coffee makers, bread-makers, VCR, microwave ovens etc may not keep time correctly. Output voltage control devices like dimmers, ceiling fan / motor speed control may not work properly (dimming / speed control may not function). Sewing machines with speed / microprocessor control. Transformer-less capacitive input powered devices like (i) Razors, flashlights, night-lights, smoke detectors etc (ii) Re-chargers for battery packs used in hand power tools. Devices that use radio frequency signals carried by the AC distribution wiring. Some new furnaces with microprocessor control / Oil burner primary controls. High intensity discharge (HID) lamps like Metal Halide lamps. Some fluorescent lamps / light fixtures that have power factor correction capacitors. The inverter may shut down indicating overload. We are located in Silicon Valley, which continues to be the leading hub for high-tech innovation and development. Our product lines range in assisting the weekend DIY'ers to light commercial construction projects with the highest quality products available on the market today. With the combined years of experience in the solar industry and NABCEP certification, we are dedicated to fulfilling all of our customers' solar needs. Sometimes we need to contact you for additional verification. These high quality products are guaranteed to work. HOW MANY WATTS AND AMPS IS EACH CELL? For the 3x6 cells, all WHOLE cells are. 5 volts and 3.6 amps peak = 1.8 watts peak power. For the 6x6 cells, power varies from 3-4 watts peak power. POWER = VOLTAGE x CURRENT WHAT IS A DIODE AND HOW DO I USE IT IN MY SOLAR SYSTEM? A diode allows current flow in one direction. It can be used to block backflow current from the battery to the solar panel. The gray band (red taped side) is the positive side which points toward the charge controller and the white taped side is the negative side. This listing is currently undergoing maintenance, we apologise for any inconvenience caused. The item "COTEK SP3000-124 3000 WATT 24 VOLT HEAVY DUTY PURE SINE POWER INVERTER (SOLAR)" is in sale since Monday, July 9, 2012. This item is in the category "Home & Garden\Home Improvement\Electrical & Solar\Alternative & Solar Energy\Chargers & Inverters". 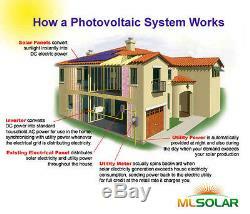 The seller is "mlsolar" and is located in Campbell, California. This item can be shipped to United States.